Tom Whitby stated in a recent blog post addressing Connected Educator Month that: “Being connected is not an add-on or a luxury for educators: it has become a necessity”. I could not agree more, there are so many benefits to being connected with the wider world that were not possible in the past. The question that constantly comes up though is why are there not more people connecting? Why are there not more people sharing their ideas with the wider world? In a previous blog I wrote about what I perceive as being some of the benefits of blogging. However, what is often missed in these discussions is why more teachers do not jump on board. Some reasons that come to mind are that teachers do not see any direct benefit for them and their teaching. They do not really use the internet ‘like that’. They connect enough with the people that really matter and they are the teachers in their team. The biggest difficulty though, in my view, is finding the time to grow and cultivate all my ideas into legible arguments, something that they feel confident to publish. In a piece about writing, Bill Ferriter suggests dedicating set times for writing. This is a strategy that I have heard before, but I think that it only elevates a part of the issue. Many teachers that I know already feel challenged in finding the ideal work/life balance and believe that writing a regular blog just isn’t a priority. In response to the dilemma of time, in a recent episode of the Edtech Crew, interviewee, Ian Guest, stated that “a blog in the first place is for yourself, it has to be”. His reasoning is that it is only then that you will find the extra time needed to commit to your task. I myself could not agree more and am always scraping a few minutes here and there to get my posts out there. My concern with this though is whether or not it is acceptable in today’s day and age that teachers are not connecting and being involved? Is it acceptable to just allow teachers who do not want to connect to simply stay offline? For as +Tom Whitby argues, “We must have digitally literate educators, if we want digitally literate students.” How then do we do this without going down the road of forcing teachers to keep learning blogs that they do not really care about? How do we provide a situation where teachers are not committed to writing regular blog posts. 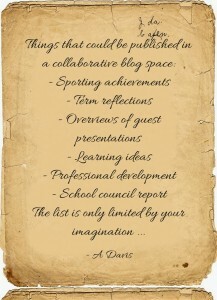 My answer is simple, why not start a school blogging space? Most schools these days seem to have their own Facebook site and Twitter handle, why not extend this and have a central blogging space as well? A place where everyone has the ability to write a post. One of the challenges with blogging is that you don’t want to publish once every month, ideally you want a steady stream of information coming in. Also, it can reflect badly on you. (‘Gee so and so hasn’t been doing much …’) In sharing the load, this daunting prospect of keeping up is alleviated. Instead of considering the space as having ‘one’ authorial voice, a school space would become a place to collect together a wide range of ideas, voices and perspectives. An example of such an approach is the Smartblogs website where a wide range of people submit different content, often specific to their area of expertise. In addition to relieving the stress of time, by writing a blog as a school, everyone is able to come on board. 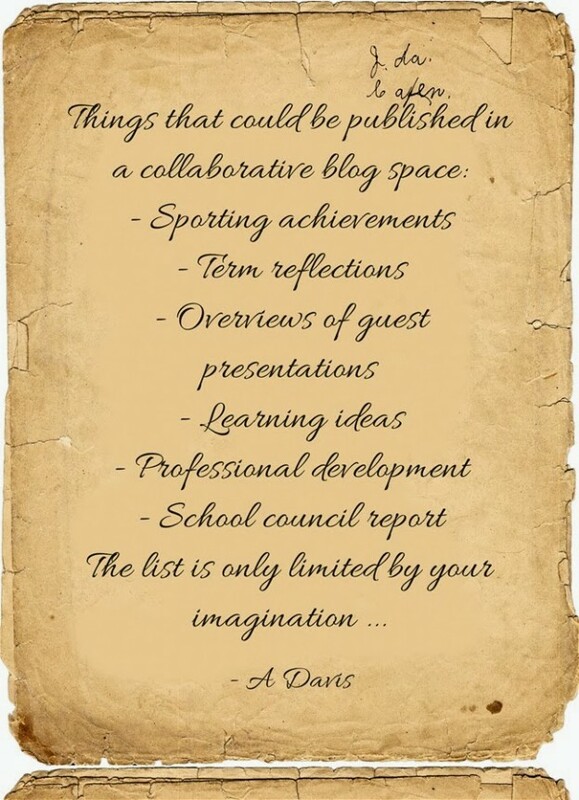 Too often the big ‘sell’ is left to the principal, with different school-based achievements celebrated through their blogging space. I wonder whether it wouldn’t be more powerful if everyone was a part of this process, even students. The reality is, can a principal know about the finer details of every single achievement that may have happened in the school and more importantly, should they? Isn’t it more empowering if those people who actually facilitate events and may have organised then then actually share their achievement. This is often what happens with the school newsletter, why can it not happen with the school blog? Everyone talks about the power of ‘student voice’, but what about the power of the ‘learners voice’ – this includes teachers and students alike, as well as teaching and non-teaching staff. Such a blogging space would therefore offer a place where everyone’s ideas and achievements can be recognised in a way that does not put pressure on one solitary voice. In addition to sharing (isn’t that enough), by creating a school blogging space staff would be getting a hands on experience of many conundrums facing us today, such as tagging post do that they are able to be searched easily and publishing for an often unknown audience. Working in a collaborative manner where the school is involved would hopefully create an environment that breaks down some of the fear with taking on the unknown, a space where staff can learn and learn together. This idea is still in its infancy. I would love anyone feedback as to whether this is done at your school or what people see as being an issue. Sharing the Load of Blogging by Aaron Davis is licensed under a Creative Commons Attribution-ShareAlike 4.0 International License.